can any kind soul add me to the whatsapp group? i am one of the victims..
1. The details regarding the "Volks Auto Whatsapp Support Group" is in your private message. 2. I've further blurred your personal information in your receipt and have it reposted. SINGAPORE - The owner of a car parallel importer which allegedly took deposits from customers but never produced their vehicles is not in the country. Police confirmed that Volks Auto owner Alvin Loo, 36, left Singapore in early December, well before customers discovered his business was closed on Dec 13 and made the first police report. On Tuesday, the police met about 60 alleged victims to update them on investigations and field questions, said Mr K.K. Lo, an IT system integrator who leads a chat group of Volks' customers. Altogether, the 108 claim to have paid about $3.6 million to the company in deposits for cars that were never delivered. Mr Lo estimates the number is about 90 per cent of Volks Auto's customers, as some have gone to the police without making contact with the group. Mr Lo said they were told the case had been classified as cheating and the prime suspect, Mr Loo, left Singapore in early December. He said they were also told that all of Volks' employees had been investigated and that the police had "mobilised all possible resources to track down the suspect". Mr Lo said the victims had been asked not to divulge further details as investigations are ongoing but noted he was satisfied with the update. THE story this week of more than 20 people who paid good money to a parallel importer for cars they will probably never get is a familiar one. Drawn by advertised prices that were about $10,000 lower than prevailing rates, they had each paid $20,000 to $30,000 in down payments to Volks Auto. The company is now closed, and going by past cases, the car buyers will likely have to write off their losses. Several similar episodes have been reported by The Straits Times in recent years. Last year, a group of buyers were conned by a used car firm called Galaxy Carz. The now defunct company had apparently sold them cars it did not have rightful possession to. The cars were eventually repossessed, leaving the new buyers poorer and car-less. The same year, another used car firm, called KS Automobile, cheated customers in the same manner as Galaxy. In 2010, a firm called SQ Carz collected payments but failed to deliver cars. That same year, a group of buyers discovered that Mirage Motor was not what it seemed when the company simply ceased to exist overnight. Industry watchers said it is not uncommon for some small-time car firms to come and go, changing names and shareholders in the process to shake off debtors or customers with unfulfilled orders. But the modus operandi of choice seems to be this: Set up a $2 company (so-called for the low fee to register a company), advertise cars with unrealistically low prices, collect deposits from eager buyers who think they have found a bargain, close shop, set up another $2 company with a new name, and repeat. Although police reports have been filed, no one in recent memory has been taken to task. Some victims were told by police to seek civil recourse. It is not known why the law had taken such a stance in those cases, but it could have been because it was hard to prove intent. Nevertheless, it is understood that police are viewing the latest case involving Volks Auto as criminal. Beyond obvious cheating cases, the motor trade is rife with less overt but equally dubious practices. Cases of protracted delays in delivering a car are common. Cases of buyers being asked to pay more after a price has been agreed on are common. Cases of cars severely damaged in accidents, fires or floods being repaired and resold are also not uncommon. Ditto instances of cars delivered without advertised features, with warranty agreements that are not honoured and, of course, with serious defects. After all, when just about anyone can set up a motor company without being screened for financial capability or track record, you can expect more than a few black sheep in a field of more than 400 players. It was for some of these reasons that the Singapore Vehicle Traders Association - a body made up largely of used car traders and parallel importers - teamed up with the Consumers Association of Singapore to set up a CaseTrust accreditation programme in 2009. Businesses that joined the programme had to first prove, among other things, that they were in good financial health and had transparent and fair trade practices in place. They also had to furnish an insurance bond of $50,000, which would help to settle any customer disputes that might arise. Members' shopfronts display the CaseTrust decal. Of course, consumers are not always aware of this programme (well-publicised as it may be). Or even if they are, they are often blinded by cheaper prices elsewhere. And they may well be lulled into a false sense of security that this is safe and well-regulated Singapore - not exactly a place associated with shady businesses. Yet, shady businesses in the motor trade exist, often with shiny shopfronts. Perhaps it has to do with the fact that cars are such big-ticket items here, and that perpetrators know that they need only fleece a dozen people and they stand to walk away with millions. If that were true, why is the real estate market not faced with the same scourge? Yes, there have been cases of real estate agents embezzling money, just as there are car salesmen who pocket deposits paid by buyers. But there have not been cases of property companies set up to sell homes or offices that they had no intention or ability to deliver. Not here, anyway. Could it be that a property purchase is done through lawyers? It is worth thinking about. After all, a car here costs as much as a house in most other countries. Shouldn't consumers invest in checks by professionals who can determine if the vehicle for sale is free from encumbrances, that the seller has the right to sell it, or that the motor company has, in fact, invoices for cars in its premises? Barring this course of action, consumers should simply have their wits about them. That includes not buying from sellers with no established track record, and not buying from so-called $2 companies. Also, as the old adage goes, if something seems too good to be true, it usually is. Insurance scheme for motor industry? THE consumer watchdog has suggested an insurance scheme to protect those who have put down money to buy vehicles, in the wake of a cheating case involving millions of dollars in deposits. The scheme could work like the one for the spa industry, said the Consumers Association of Singapore (Case), in which customers who buy a package provide details like their identity card number and get a certificate of insurance on the spot. Premiums are paid by the spas, which have CaseTrust accreditation. Such a scheme is worth adapting for the motor industry, said the Singapore Vehicle Traders Association (SVTA), which has a joint CaseTrust accreditation scheme with Case. Right now, dealerships in the accreditation scheme furnish an insurance bond of $50,000, which would help settle any customer dispute that might arise. But this sum is not enough to cover all buyers in cheating cases, considering how most of them pay a deposit in the tens of thousands. SVTA honorary secretary Raymond Tang said it is considering either doubling the bond to $100,000 or adopting the spa industry's model - but changes can be made only after next June, when the current insurance plan is up for renewal. The CaseTrust-SVTA accreditation scheme has only 28 members, with eight more being renewed. This is a small number out of SVTA's nearly 400 members and of Singapore's total car dealers, estimated by Mr Tang to number 700 to 800. "Most of the dealers say that whether they have it or not, it's not a very big issue," he said. "If more customers are going to CaseTrust dealers, then there will be more dealers wanting to join us." Case had suggested the insurance scheme to safeguard car buyers' interest after a case involving dealer Volks Auto. It shut its doors more than two weeks ago after collecting at least $3.6 million from buyers without delivering the cars. It is the first time a motoring business owner has "outright cheated" consumers of such a large sum, said Case executive director Seah Seng Choon. But car dealers and consumers alike have expressed reservations about the proposed scheme. Zion Auto Gallery director Lawrence Tan is open to buying an insurance policy for customers' deposits, but asked if this would weed out rogue dealers. CaseTrust accreditation is more valuable as participating firms would have had their finances vetted by Case, he added. Corporate banker Melvin Lai, 47, thought the scheme feasible but feared that costs would be passed on to consumers. Mr K.K. Lo, 53, who represents 108 people claiming to have been cheated by Volks Auto, suggested consumers pay the $10,000 certificate of entitlement bidding deposit directly to the Land Transport Authority instead of through dealerships, as is the case now. The IT system integrator said this would prevent rogue dealers from absconding with the money. Case has suggested that the authorities "look into" pre-payment, especially for big-ticket items like vehicles. When asked, the Ministry of Trade and Industry said the Government does not regulate the purchase of motor vehicles and the collection of deposits by car dealers. This is similar to practices in places such as Australia, Britain, Canada and Hong Kong, it said. Recently, a car salesperson from (can be considered Volks Auto competitor) told me that the Volks Auto case involved a police officer whom recommended 9 car buyers to get their cars from Volks Auto and that this police officer himself did receive his car from Volks Auto. I am unable to verify what he said from the media reports so far and if you know of this, please let me know so that upon verification, I can post it here. I am sad that this case seems to have gone cold? 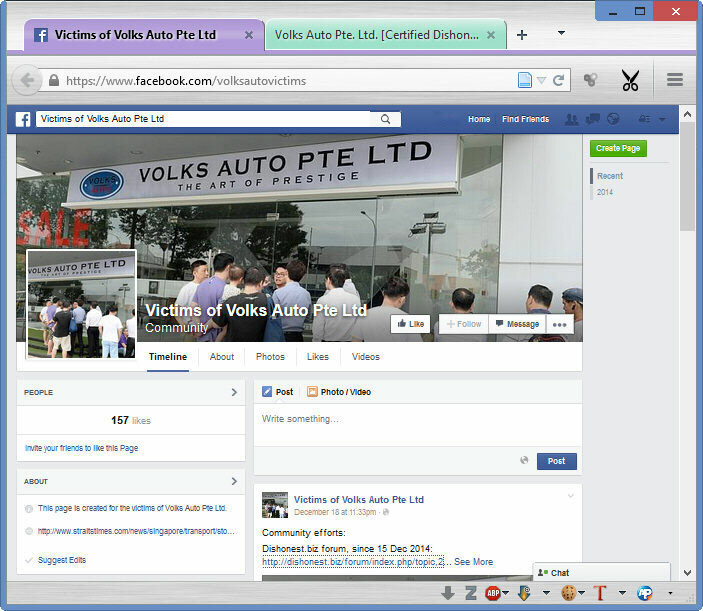 Yesterday a Volks auto employee called Koh Chek Seng was hauled to court. Anyone knows who is this guy? SINGAPORE - A car dealership employee, who was hauled to court in 2015 to face a charge of abetment to cheat, had his charge amended on Wednesday (Jan 6) to conspiring to commit criminal breach of trust. Koh Chek Seng, 33, had worked for Volks Auto, which shut its doors after allegedly collecting a few million dollars from more than 100 buyers without delivering the cars. He is now alleged to have conspired with Volks Auto owner Alvin Loo Mun Yu and another man, Jason Koh Chi Kang, to misappropriate over $4.6 million in deposits between July and October 2014. Koh was offered bail of $1 million, but he told the court that he could not raise the amount. The case will be heard again on Jan 20. 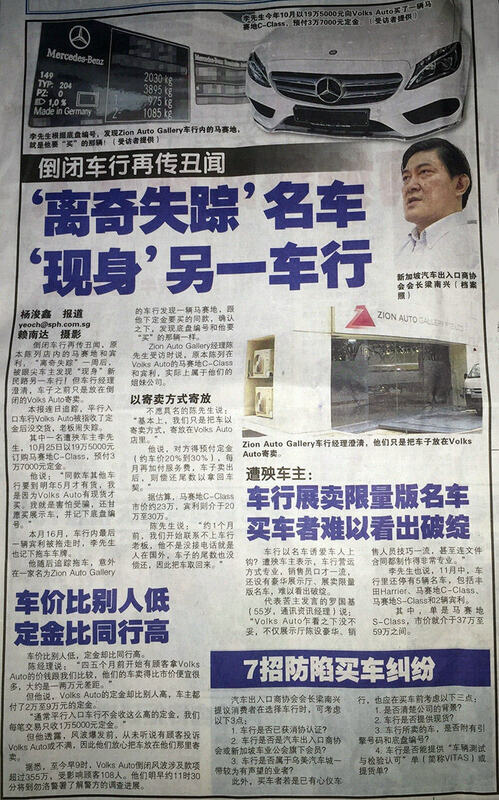 Volks Auto made the news in 2014, after disgruntled customers gathered outside the parallel importer in MacPherson Road in search of Loo. Some customers also contacted the media to highlight their plight. Parallel importers such as Volks Auto buy cars from dealers abroad and sell them in the local market for a profit, typically at prices lower than those charged by authorised dealers. Drawn by advertised prices that were about $10,000 lower than prevailing rates, customers who were allegedly cheated said they each paid $20,000 to $30,000 in down payments to Volks Auto. Police later confirmed that Loo left Singapore in early December 2014, before customers discovered his business was closed. If convicted of his criminal breach of trust charge, Koh faces life imprisonment, or jail of up to 20 years and a fine. Alvin is the sole shareholder and director of Volks Auto. There were 2 salespersons helping the mastermind, Alvin Loo. One was called Andrew and another one was called Andy without putting up their surnames and quite clearly they wanted to run this scam business at the first place. Now I wonder which one is Andrew and which one is Andy.